Data and Business Intelligence is becoming ever more critical to businesses in leading decision making and discovering new opportunities. We understand how challenging and expensive it can be to drill down into a single data source, and harder yet to gather a big-picture view across many data sources. We’re here to make your data accessible. In order to gain insight across various data stores, organisations have traditionally found the need to implement data warehouses. These solutions are focused around structured data and rigid schemas. In our experience, many businesses will benefit from a more agile solution, which has been coined a ‘data lake’. 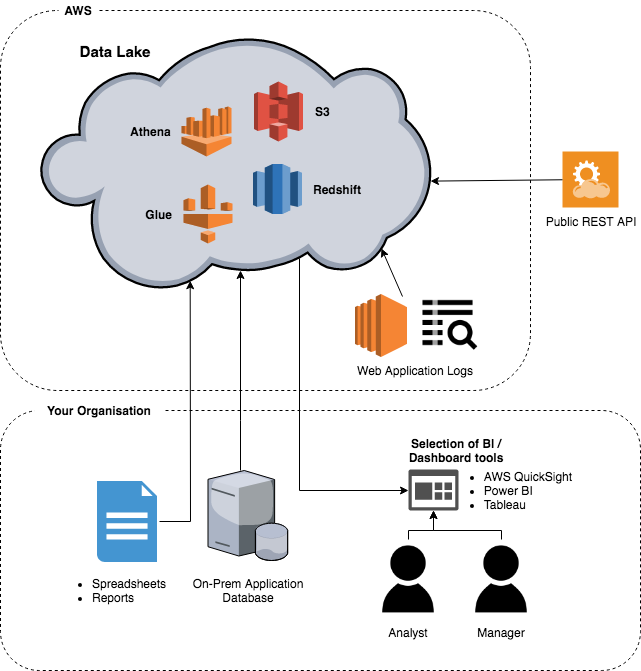 Unlike a data warehouse, a data lake doesn’t necessarily set out to relate specific data sets in its design. Based on the fact that cloud storage is cheap and infinitely scalable, we have the opportunity to use services such as Amazon S3 to store your all of your various data sets in one place (structured or unstructured). You may have data in many places: On-prem application databases, documents in file stores, or data from external APIs. We can create bespoke solutions to extract, transform and load all of your data. Our solutions will be designed to work with your choice of business intelligence tools. Architect data solutions which are agile and work with your choice of software. Develop ETL solutions built on top of the latest cloud services. Incorporate data security by design. Contact us for a discussion on how Idea 11 can help you leverage your data in AWS.